Russell has been busy! He has just completed a concert’s worth of new works to be premiered by NEXUS on June 13 at the Open Ears Festival in Kitchener, Ontario. One of those is the “Moondog Suite”. 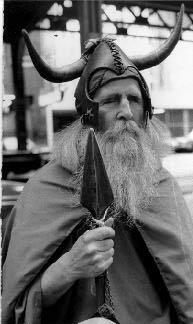 Moondog was a blind American composer, musician and poet who was born in Kansas as Louis Thomas Hardin and died in 1999. He moved to New York where he made his home on the streets, even though he was not homeless. (He had an apartment in Upper Manhattan). As Wikipedia tells us, “Most days he could be found in his chosen part of town wearing clothes he had created based on his own interpretation of the Norse god Odin” leading to his nickname “The Viking of 6th Avenue”. Wikipedia provides an excellent overview, and there is an entire site called Moondog’s Corner that you can find online full of wonderful stuff. You can also find Moondog videos on Youtube. Moondog had already begun playing drums before losing his sight in an accident at age 16. He continued to pursue music and was principally self-taught. In New York he met Leonard Bernstein and Toscanini, as well as jazz greats Charlie Parker and Benny Goodman who influenced his later work. He adopted the pen name “Moondog” in honor of a dog – they “howled at the moon” together. Goodman and Toscanini helped him win a Supreme Court case against a disc jockey who was using the name Moondog for a number of items on his show; they testified that Moondog was a serious performer and had been known as Moondog long before the radio show adopted the name. Moondog had come into contact with Native American music and drumming as a child and after performing in a Blackfoot Sun Dance in 1949 he began to incorporate it, along with jazz, classical and ambient sound (such as fog horns or the subway), into his music. In the 1970s, Moondog moved to Germany where he wrote hundreds of compositions in Braille that were then transferred to sheet music. He returned to Brooklyn in 1989 at the request of Philip Glass to conduct the Brooklyn Philharmonic Chamber Orchestra, at the New Music America Festival in Brooklyn, and that set off a whole new interest in his music. Both Glass and Steve Reich took Moondog’s work very seriously. Canadian composer and producer Daniel Lanois included a track called “Moondog” on his album/video-documentary “Here Is What Is“. I am sure that one of the the attractions of Moondog’s music for Russell Hartenberger is what Moondog called “snaketime”. This is what characterized Moondog’s music and in a wonderful quote Moondog described it as “a slithery rhythm, in times that are not ordinary … I’m not gonna die in 4/4 time”. A documentary is scheduled for release this year, called “The Viking of 6th Avenue”, is in production for release this year, and Robert Scotto has written “Moondog, The Viking of 6th Avenue: The Authorized Biography” with a preface by Philip Glass. this information is really helpful. i would love to know more about the characteristic of his songs as a minimalist composer and does his song Do Your thing have a musical sheet.? if so where can i get it. Great work with this.. its really fantastic . Hi Daisy. I apologize for missing your message here! I will pass this along to Russell and ask about “Do Your Thing”. Thanks for writing. Hi again, Daisy. Russell is not familiar with “Do Your Thing”. He says that as far as he knows, Moondog wrote his songs in Braille and some of them have been transcribed into regular Western notation, but unfortunately, Russell does not know how to get these transcriptions. If you find out, let us know!